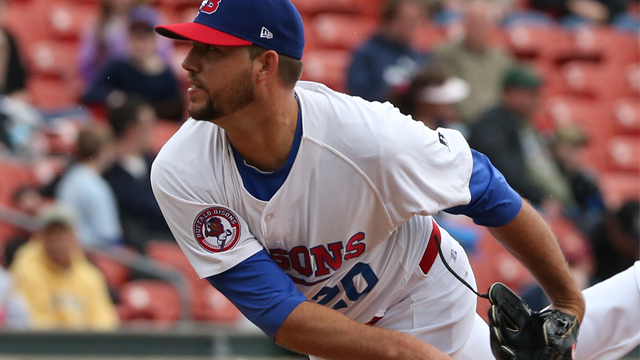 Ryan Tepera had 17 strikeouts in 15.2 innings of work for the Bisons this season. The Blue Jays today announced that they have recalled RHP RYAN TEPERA from the Buffalo Bisons and optioned RHP CHAD JENKINS to the Herd. Tepera will be making his MLB debut with the Blue Jays. Tepera was 1-1 with a 0.57 ERA in eight relief outings for the Bisons. In 15.2 innings of work, the righty has struck out 17 and allowed just six hits and five walks. Tepera spent the entire 2014 season with the Bisons and was 7-3 with a 3.66 ERA and two saves in 51 appearances (64.0 IP, 67 SO). Jenkins began the season with the Buffalo Bisons and was recalled on May 4 and pitched in one game for the Blue Jays in relief (2.0 IP, 2 H, R/ER, BB, 2 SO). For the Bisons this year, Jenkins was 1-1 with a 2.89 ERA in four starts (18.2 IP, 10 SO).